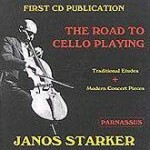 Janos Starker recorded “The Road to Cello Playing” in 1967 to demonstrate to proper performance of typical etudes studied by cellists. “The making of the record left me more exhilarated, more frustrated, and taught me more humility towards my profession than other record I have ever made. Although it was issued on a small, short-lived LP label (Virtuoso) and briefly reissued on another (Star), this collection became an important teaching tool. Cello teachers wore out their LPs making tape copies for their students. And many lovers of the cello, even if they were not players themselves, bought the recording to hear Starker’s amazing playing of music by Popper and Paganini. This CD reissue, produced in cooperation with Starker, has added live broadcast performances of three virtuoso concert works for solo cello, music by Hindemith, Cassadò, and Bernard Heiden. These performances have never been published before, and the brief Heiden Variations on “Liliburlero” is a recording premiere.